In the mid-18th century, the contest for control of the lands west of the Appalachian Mountains was far from decided. 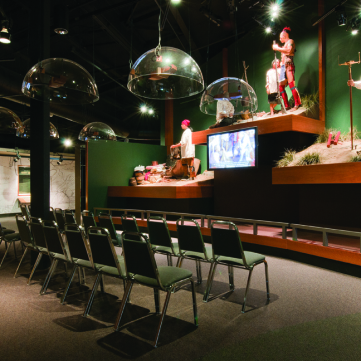 Among the relative newcomers to the region were Shawnee, Delaware, and Seneca Indians in search of autonomy in the Ohio Country, as well as military representatives from the two most powerful nations in the world: England and France. The clash of these two great empires, which began in the backwoods of present day Western Pennsylvania, forever changed the course of world events, had powerful repercussions for Native America, and ultimately inspired thirteen rebellious colonies to declare their independence from Great Britain. 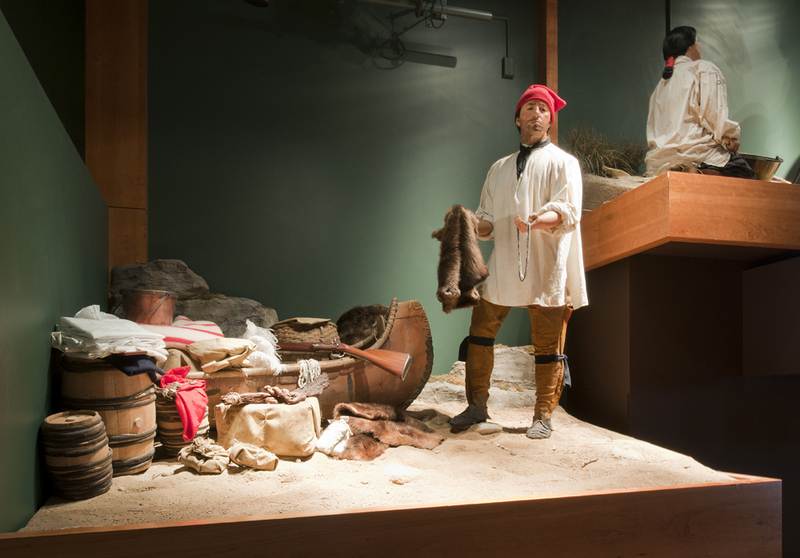 Explore these momentous events and their impact on our region in the permanent second floor exhibit, Fort Pitt: Keystone of the Frontier. 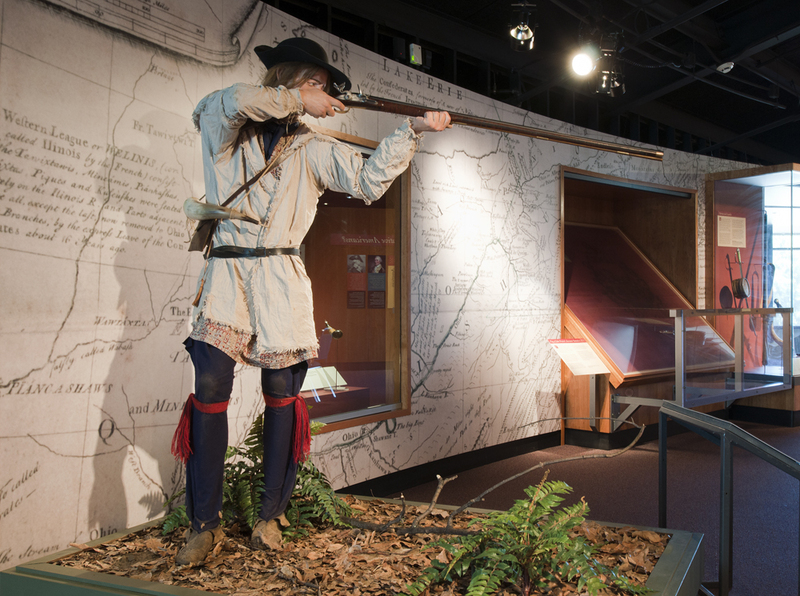 The exhibit features two audio-visual presentations covering both the French & Indian War and the American Revolution, intricate dioramas of the earliest forts at the Point, and numerous artifacts, all of which paint a vivid picture of war, trade, adventure, and diplomacy on the 18th century frontier. Whose Land Will This Be? 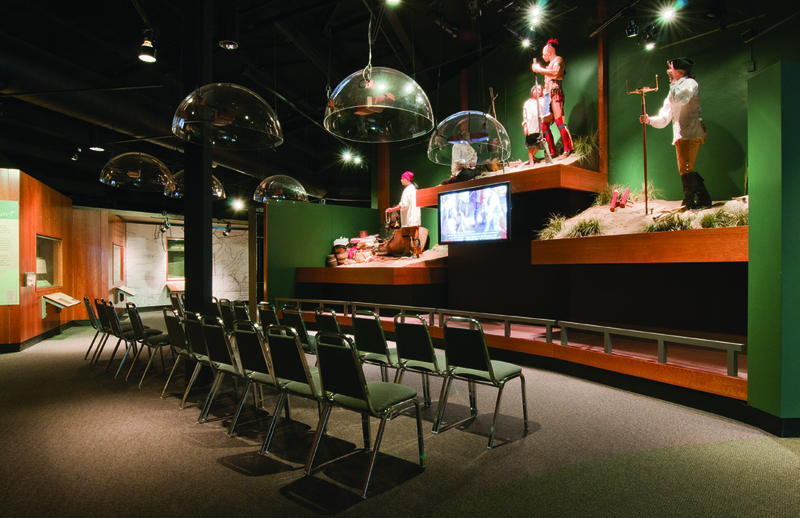 The spacious second floor theater introduces visitors to the French, English and Native Americans who once competed for control of the Ohio Valley. A scruffy French trader offers a plethora of European goods in exchange for furs. A scruffy French trader offers a plethora of European goods in exchange for furs. 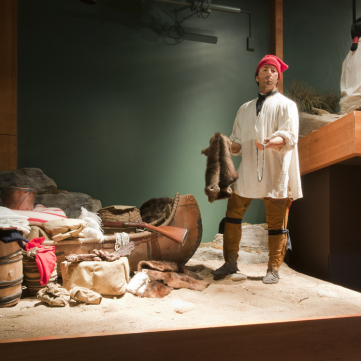 By the mid-18th century, English traders had also infiltrated the Ohio Valley, offering similar wares in hopes of swaying Native inhabitants to the British interest. Following the French & Indian War, a wave of white settlers flooded into the Ohio Valley, sparking a brief, but bloody, war with the Shawnee in 1774. Following the French & Indian War, a wave of white settlers flooded into the Ohio Valley, sparking a brief, but bloody, war with the Shawnee in 1774. 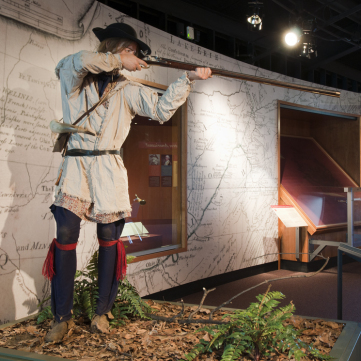 The following year, as shots rang out at Lexington and Concord, the same frontiersmen marched hundreds of miles to the relief of the fledgling American army at Boston.